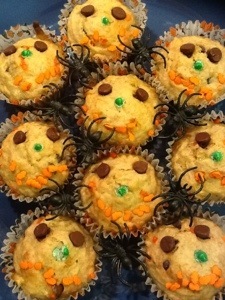 Banana Muffins | ARTZCOOL'S BLOG! A couple weeks ago, I was looking for recipes for banana muffins because I had four really ripe bananas that I wanted to use up. 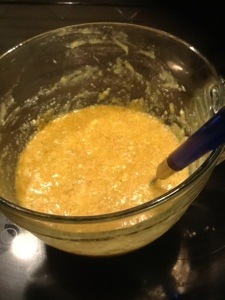 Most of the recipes were basically the same, but I came across this recipe on the Livestrong website. 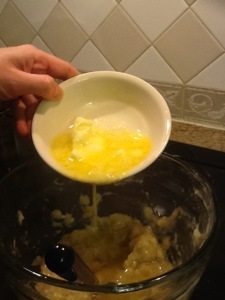 It was the same basic ingredients, but it was put together differently than most cakes or muffins, so I thought I would give it a try and see if there was a difference in the final product. The ingredients you need are 4-5 bananas, 1/2 cup butter, 1/2 cup brown sugar, 1 tsp vanilla, 2 eggs, 1tsp baking powder, and 2 cups of flour, I used whole wheat. 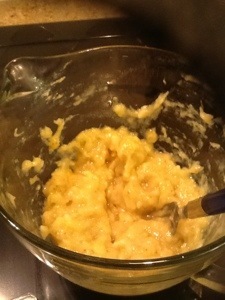 Then to the bananas, add 1/2 cup of brown sugar, 1tsp of vanilla, and 2 eggs. 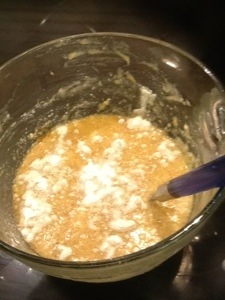 Sprinkle 1tsp of baking powder on top and mix in. 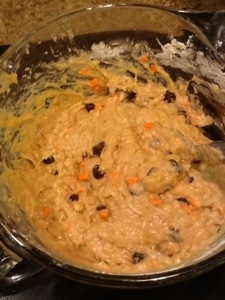 Next, add the chocolate chips and 2 cups of flour. 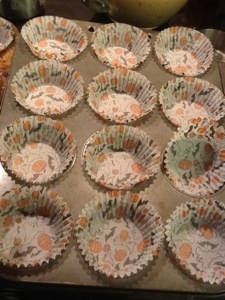 Get your muffin tins ready… I made these just before Halloween, so I used Halloween cupcake liners. 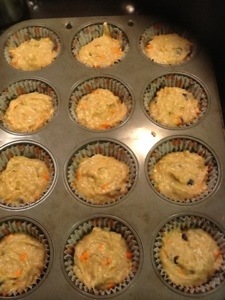 Scoop the batter into the cupcake tins so they are about 2/3 full. 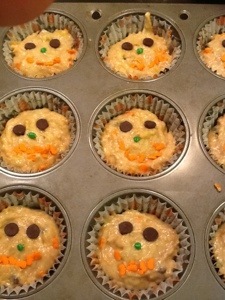 I will admit, they are not the prettiest things I have ever made, but they are very good! They certainly didnt last that long!